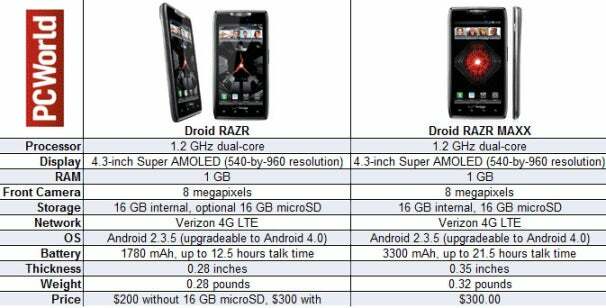 Motorola's Droid Razr Maxx is set to launch on Verizon Wireless for $300, combining monster battery life with a relatively slim figure. Motorola claims that the Razr Maxx gets 21 hours of talk time on a charge. More amazingly, the phone can stream seven hours of video on Verizon's battery-draining 4G LTE network, Motorola’s senior product marketing manager, Jeff Hadden, told me at CES. The Droid Razr mostly uses brute force to beef up battery life, with a 3,300 mAh lithium ion battery that's nearly twice the capacity of the original Razr. Motorola's “Smart Actions,” which automatically control settings like GPS, Wi-Fi and Bluetooth, may also play a role. Also, Razr Maxx buyers won't have the option to save $100 by forgoing the included 16 GB microSD card. Look for PCWorld's Razr MAXX review soon, as we put Motorola's battery claims to the test.